Dogs are our best friends so it's only natural that we want to express our affection to them any way we can. Some owners love buying cute outfits for their pets. Others never skimp on getting the best smelling dog shampoo or the most fashionable collars. However, owners that do it through food can end up causing more harm than good as overfeeding can lead to obesity and develop serious health conditions such as diabetes, heart disease, and even cancer. The good news is that it is easier for dogs to stay in shape than it is for humans. All your furry friend needs is a little help from you to get back to a healthy weight. 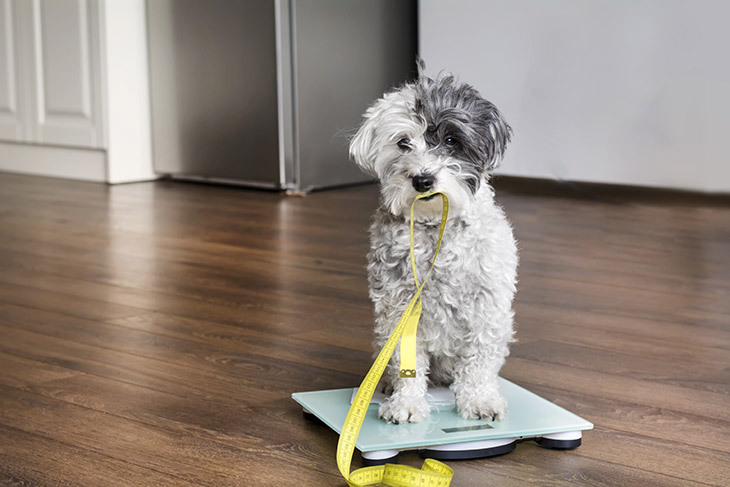 From changing his diet to increasing the frequency of your walks, there are many easy-to-follow tips that you can use to help your dog lose those extra pounds. Here are 5 easy ways to help your dog lose weight. Most commercial dog foods are filled with calories which give your dog more energy than he needs. Add to that the sedentary lifestyle of a typical house pet and you got a recipe for canine obesity. The easiest way to counter this effect is to use smaller portions. Dog food brands are notorious for overestimating portion sizes in their bags, so cutting down progressively and using a measuring cup will help you feed your dog just the right amount of food that he needs. An even better solution is to stop buying additive-heavy commercial dog food and start learning how to prepare healthy homemade dog food recipes. Despite being carnivores, including small amounts of vegetables in a dog's diet can do wonders for his health. Unlike modern processed dog foods, which are filled with fattening carbohydrates, fresh vegetables like green beans and baby carrots are rich in essential vitamins that promote weight loss by increasing the speed at which the body burns fat. But before you run to your fridge to grab a carrot for your dog remember to crush or pulverize the veggies to make them more digestible and always make sure that they never represent more than 1/4 of the food portion. Treats are notoriously deceptive in that despite their small size they punch above their weight when it comes to calorie content. Packed with sugar and fat, treats can blow up your pet's waistline and ruin his health. So instead of giving him factory-made treats a healthier option would be to substitute them with small amounts of natural, low-calorie foods such as salmon or sweet potatoes. Better yet, use these healthy foods as a way to introduce non-food rewards. For example, you could give your dog a little treat the first few times he would fetch the ball and later on use a belly rub instead of food as a reward. Exercise is a key component of any fitness program but also one of the least popular among people. Luckily for you, there's no reason to miss another walking session just because your friend is busy. With their love of the outdoors and playing, dogs make the best exercising partners and simply taking your pet to walk a few minutes each day can do a lot for his weight. However, make sure to take it slowly and allow your dog enough time to adapt himself to his new routine. Alternatively, If your dog is old, has joint problems, or is too obese to walk you could switch to canine hydrotherapy to give him a good swimming workout. Even the best diet can't supply everything your dog needs and that's where supplements come in handy. Omega-3 fatty acid and carnitine are particularly useful for a dog who is struggling with weight issues. Omega-3 can be found most commonly in fish oils and is widely prescribed for its anti-oxidant properties and its ability to regulate weight. Carnitine, on the other hand, helps the body to synthesize fatty acids, prevents diseases like diabetes, aids weight loss, and promotes the growth of lean muscle. However, make sure that you get the green light from your veterinarian before you start giving any supplement to your pet.